2 week update + Asylum Jam! 2 weeks back, my goal was to add the basics of Actions affecting Mood… and Mood affecting Actions. The Mood/Action System! If you’ve ever played Long Live The Queen, you’ll recognize what I’m up to. When a Hero takes an action, it will affect a certain statistic (be it an attribute or a mood) by increasing it’s value. 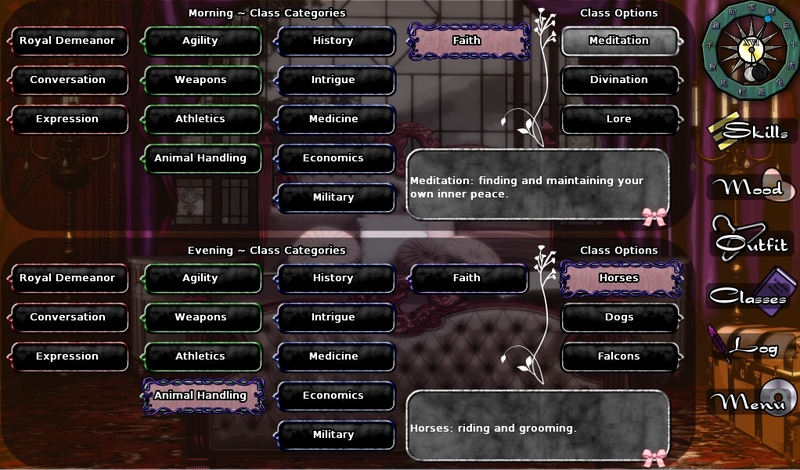 With the Mood/Action system, these values are now modifiable. 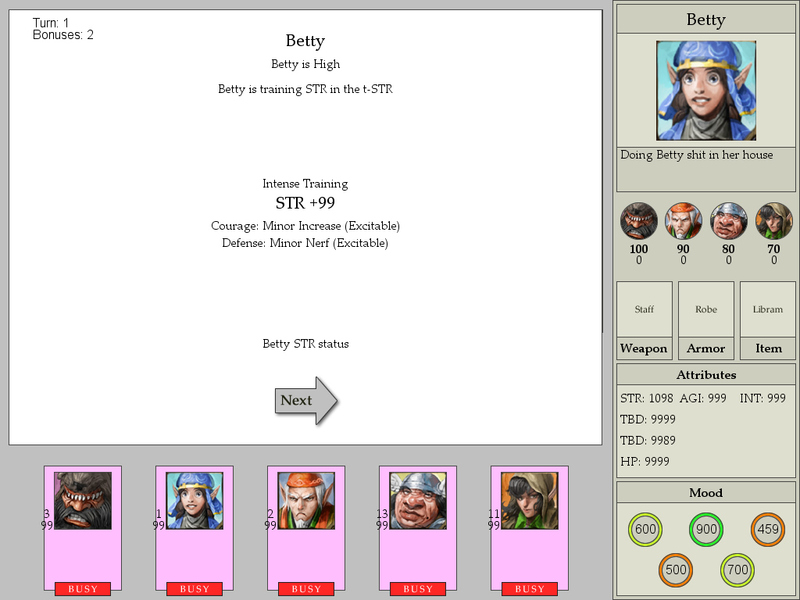 In the example below, Betty is Excitable. When a Hero performs an Intense Strength Training Action while Excitable, they will receive a minor increase to their Courage Mood and a minor reduction in their Defense attribute.Being excitable while getting stronger will increase your fearlessness… but that can also be reckless. When I get around to polishing the game, there will be much more explanation of why this is the case, in the form of beautiful illustrations or text descriptions, but for now it’s just in my head. One of the more interesting design decisions I will have to make is whether to make these Mood/Action links transparent or hidden. Do I want players to know exactly what will happen when they perform an Action while in a certain Mood? This makes planning and strategy easier, but it also removes a lot of fun discoverability (especially with niche combinations of Moods and Attributes). To master the game and win, players will need to know all the links… so perhaps one option is to make them all discoverable but once discovered they will be displayed to the player. The game is all about repeat play-throughs, so that could be a fine solution. If you’re interested in playing a system similar to the Mood/Action system, do check out Long Live The Queen. It’s been a big inspiration to both Outdoor and Eternal Struggle. Despite its wrapping paper (it’s very anime looking), it’s a truly interesting and difficult ‘planning game’ that’s ticks a lot of the boxes that I’m trying to tick myself with Eternal Struggle. Before Day 10 I was in a bit of a slump. The woes of Indie Development were getting to me and I was having all kinds of creative issues. I was wondering if the concept of Eternal Struggle was even fun at all, “What if it’s just garbage?” was a question I was asking myself. I have so much still to do on it, but it still wasn’t feeling like a game yet and I’ve wanted to expressly avoid the situation I got into with Uffizi, working on a not-fun prototype for too long. To get out of this funk, I decided to work on an entirely new system… one which wasn’t based on all the work I’ve been doing for the last couple of months. Hero relationships haven’t been discussed that much since I started this project. All systems I’ve built so far have been based around Heroes as independent actors. One of the reasons I started this game, especially after the feedback from Outdoor, is that managing your Heroes while befriending or avoiding other Heroes in the same area is a challenge I want players to have. A slightly scary thought is that all my current systems feel ‘complicated enough’, so adding relationships just makes the game really over-the-top deep… but whatever, I want to see if it works! As you can see from the screenshot, the Town has changed a lot. I actually had to rebuild the whole thing because I’d gotten all the dimensions wrong and the mp_grid pathing systems I wanted to use from GameMaker were bugging out like crazy. I had to redo a ton of work with this update, so I’m pretty proud of how much got done in a single day. Firstly, the Town is now perfectly aligned to a grid… which is used to calculate paths to and from buildings. These paths are used by Heroes, who move from their current building to the chosen one when an Action is picked. Debugging was the main delay on my progress with this feature, and the result is rather small to look at on a blog. Heroes have their destinations marked when an Action button is pressed. When the turn ends, they move towards the destination. That’s it. That’s version 1.0. 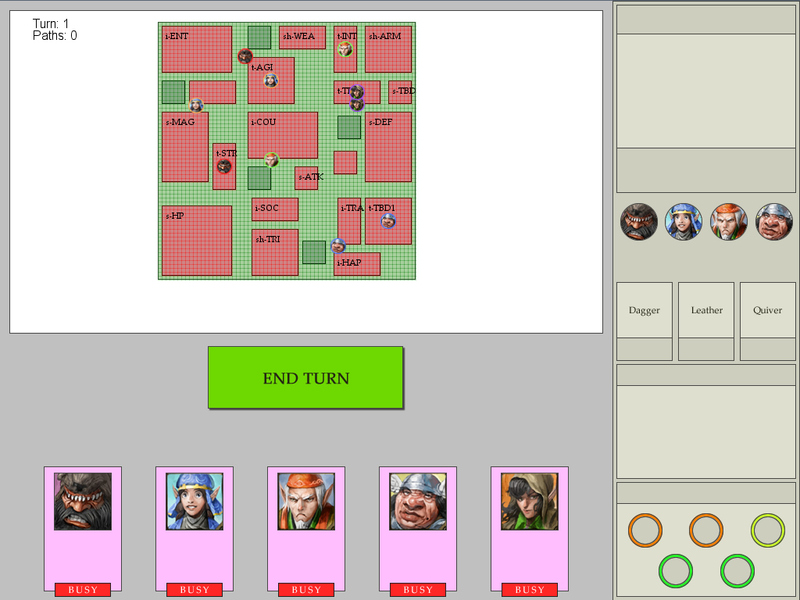 Version 2.0 is the hard part (for me, as an awful coder), as I need to generate events when Heroes bump into each other. I’ve got collision working but pausing the movement while events are concluded is proving to be a pain. That’s definitely Day 11’s task! The final thing I want to mention is Asylum Jam. You all know how much I love Game Jams, so I decided to join up with Chris & Dan from Substantial Games (my employer) and Tobias Baumann (from Perception Neuron). I’ve never worked on a horror game before so it should be an enjoyable experience. More details on that in the next blog!